Hello, everyone! Today's is a very special post for me as I am reviewing my first ARC (more on that at the bottom). 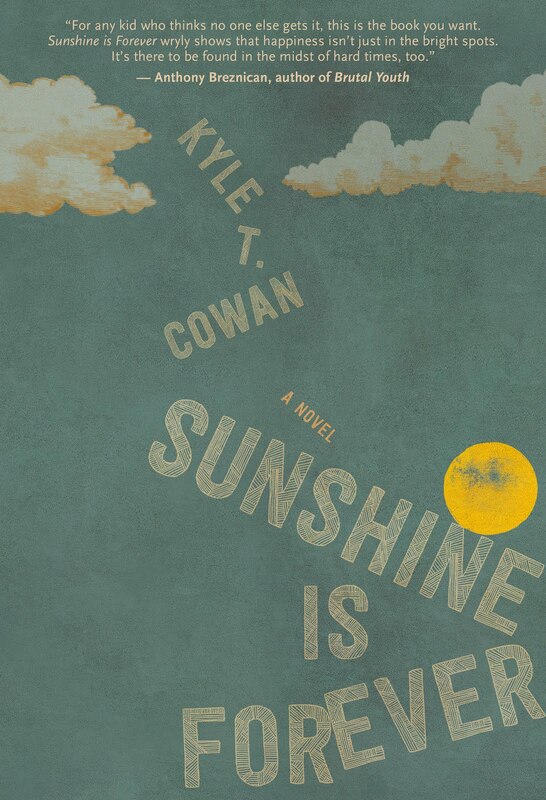 I was intrigued by the summary of Sunshine Is Forever from the second I read it, and I am now so excited to get to share my review of this amazing view into depression and the motives behind self harm and suicide. The impactful story is one I place up with many of my favorite books that tackle mental illness. It also features a male protagonist with a great voice, which we honestly don't see enough of in YA. Anyway, without further ado, to celebrate Sunshine Is Forever's publication, I am bringing you my full review of this new YA mental health fiction novel from a new author to the world of YA. Characters: 5 I found the characters of the novel to be realistic and well rounded as well as greater than the issues they represented. For much of the book, the camper's reason of enrollment, including Hunter's, are hidden from the reader, though heavily hinted at, giving the reader and author a chance to grow and form opinions about the characters from face value. This method also allows the extra layers of complexity to grow from the past with each seedling that the reader is given. The relationships established over the course of the story seemed very honest and organic. Each choice was made with a distinguishable motive, and there were no moves within the relationships whether they be friendships, romantic relationships, or mentorships. I found the relationship that Councilor Kirk tried to form with the campers to be one of my favorites. In the prison-like environment, he seemed to be the only one truly concerned with the camper's wellbeing and tried to connect to them personally. Even when the camper's pushed him away, Kirk consistently came through for the kids in big and small ways, and that really gave a necessary dose of humanity to a camp that is generally worse than prison. Plot: 5 The plot of the novel was well executed. There were many complex storylines stemming from the different relationships and intricacies that surrounded the camp and camp life, and I never felt that one got lost or was underserved because of how many there were. The book carries the high stakes tone throughout, and the reader is constantly kept guessing about the details of these characters pasts and what exactly happened as well as being roped into the action happening in the present. Writing: 4 As well as the beautiful execution of the above categories, I thought that the Hunter's voice shone authentically throughout. The writing showed Hunter's genuine progression through his time at camp through minor shifts in his worldview that were integrated seamlessly transitioning the reader from old Hunter to new Hunter with each progressive experience. The voice holds and endearing rambling quality that rings very true to life, though sometimes the author seemed to loose a bit of control over this swerving into redundancy before checking himself. I also must commend the depiction of Corin's obvious and well established manipulation of Hunter and his extreme willingness to follow her. While this idea often takes a turn for the unrealistic, Cowan does such a great job of showing Hunter's self-assurance and rationalization, it makes total sense why the events unfolded the way they did. By withholding all the major details about the past till the end, Cowan sets the reader up for a major bang right at the end, and that greater understanding ties the story up with the perfect bow. Looking For Alaska by John Green (http://www.readingwritingandme.com/2017/07/reviews-and-recommendations-week-16.html) which has many similar aspects as it takes place in a boring school and there are great both friendship and romantic relationships similar to this, though the focus is not technically mental health. It is another great male protagonist driven book.